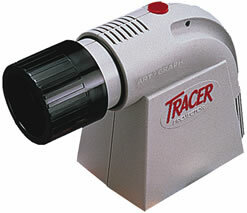 A versatile art opaque projector for the beginning artist or crafter, and Artograph®'s bestseller. The Tracer® enlarges any design or pattern onto a wall or easel from 2 to 14 times the original size. Projected image can be easily traced and colored as desired. No set-up necessary and simple to operate. Standard 100-watt bulb included. Dim the lights, a dark room is required. A great find when looking for affordable art supplies in Chicago.